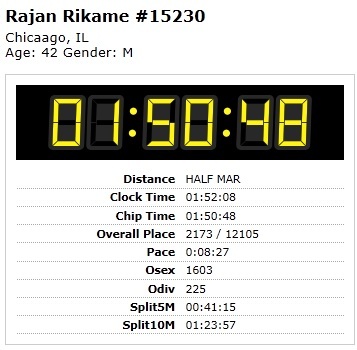 2nd time I ran this Half Marathon race to keep my Chicago Marathon Training statistics up to date. I like the route very much. The weather was perfect about 60F for such long run. I reached the start line using Shuttle service from Belmont to 63rd St, Jackson Park. The marathon started on time (7am) with great enthusiasm. 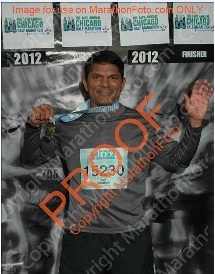 The 1st group was 2 wheeler the 2nd group was half marathoners and 3rd group was 5k run. Entertainment and water/gatorade supply kept the liveliness along the race. 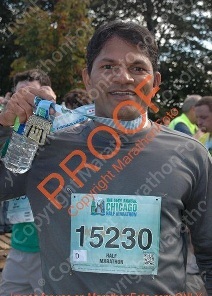 I completed the marathon in 117 minutes, which is 9 minutes faster than last half marathon. I realised, I could have done better as I wasn't exausted after the race. I followed the mile by mile strategy with 1 break for pee and other 1 for stretching at 10 mile. The male winner finished in 1hr. 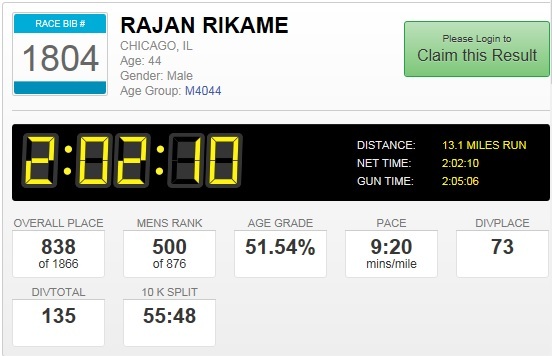 07min while I took 43 minutes more while the female winner finished in 1:18 min.